This was our second time working with Reportage Properties on their latest luxurious project Al Raha Lofts. 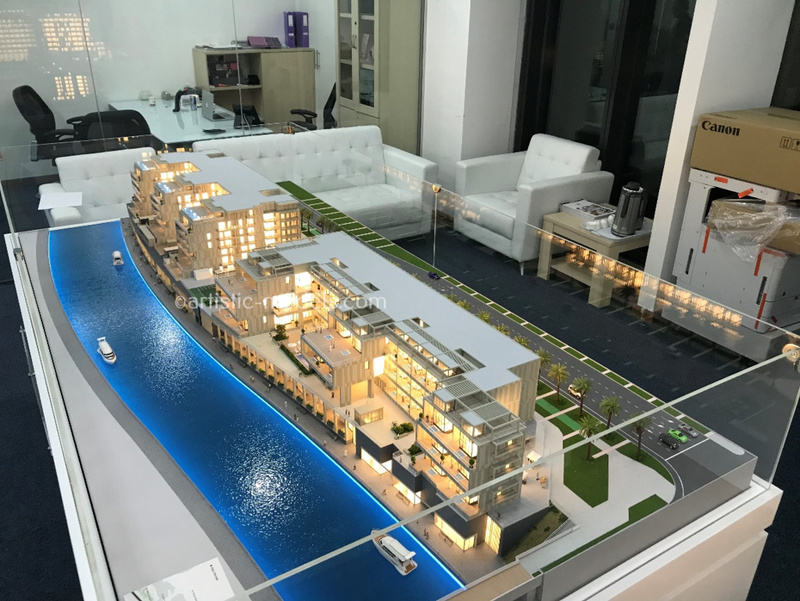 This project consists of two buildings G+8 nestled beautifully alongside the waterfront canal in Al Raha, Abu Dhabi. 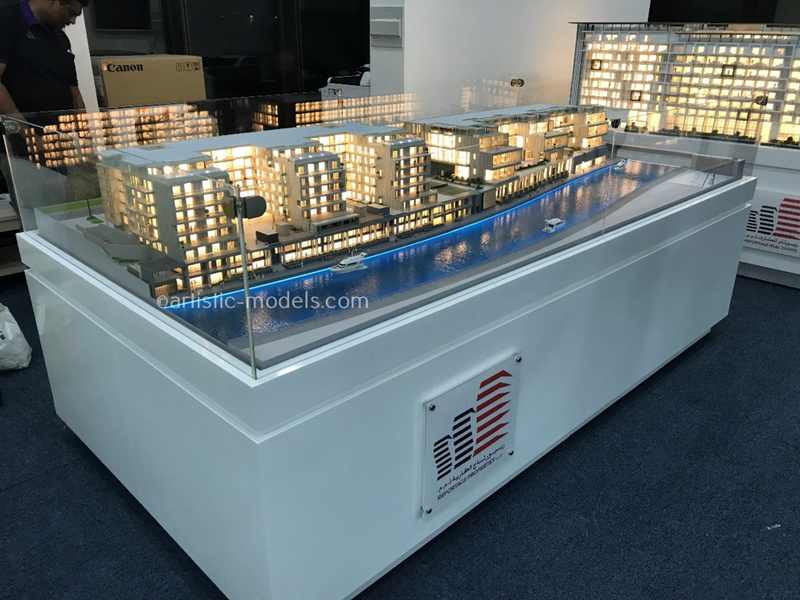 The model was made at a scale of 1:100 and measures 2.7m x 1.4m sitting on a specially made display table with acrylic fencing for protection. Throughout the model making process, Artistic liaised closely with the client’s appointed architectural consultancy and making sure to understand the design intent and providing specially made samples to convey how we would represent certain aspects of the model. 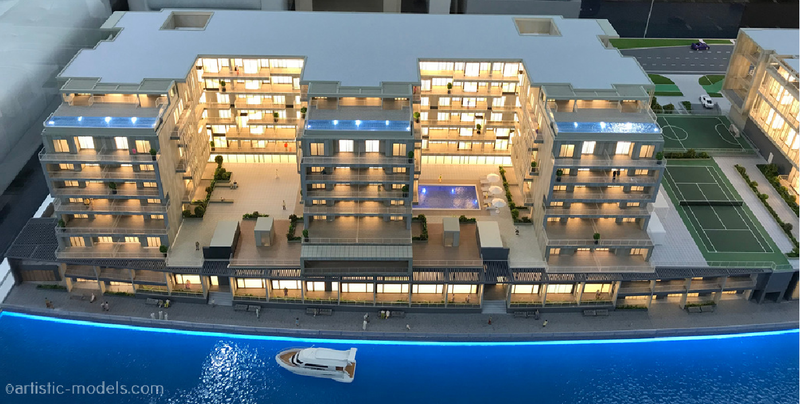 We understood the importance of the lighting and placement of the buildings to the waterfront so special consideration was given to LED lighting color choice and delicate placement of cool LEDs along waterfront edge added that touch of finesse. All colors were identified with the client and carefully calibrated to represent the overall color scheme at a small scale. With perfect craftsmanship well-executed mood lighting and well-calibrated color assignment, we believe this model outcome could not be better.